Students of EUropean identity are most often voluntary or involuntary supporters of a ready-made idea of the EU. Acknowledging the beneficial and progressive nature of the EU in a wide variety of domains of political, social or economic realms in Europe and outside does not necessarily require transforming limited and occasional identifications in a stronger identitarian package whose unintended consequences can easily exclude or function against the very values is thought to instill. The paradox of the EUropean identity is that clarifying it more means leaving out so much that such exclusion becomes an act of contradiction with itself as it opposes any minimal content of such an identity. European identity as conceptualized in the frame of EU politics is a political engineering exercise on behalf or sometimes against the EU. It excludes and it is often counterproductive. When it’s about European values, the EU should start following them and recognize Europeanness in all its plenitude as an inclusive and embracing idea and cultural project. There is no EUropean identity but there is a wider European patrimonial identity. No need to become defensive and confused about a generous creative magmatic nucleus that offers Europeans, wherever they live and regardless of any institutional frame, a reliable chance to dialogically identify with a rich and creative common continental inheritance. The attack usually directed towards the ‘unity’ of the European culture is misplaced, since dealing with a European identity is not to deal with a particular institutionalization of a historically circumstantial political culture. Some cultural unity in Europe is claimed by the daily mentalities and discursive practices even if it’s just under the form of a ‘self-organizing vertigo’ (Morin 1987). Yet this unity, to put it in Gianni Vattimo’s style, it’s a unita debole. The risk involved by EU instrumental identity making relies on constructing a destinal Europeaness that accounts as community making factor far beyond its organizational structures and aims. The idea of a EUropean identity includes a persistent and camouflaged historicism intrinsic in the European version of quasi – universalistic modernity in the sense that ‘to invoke Europe often involves the illusion that there is a privileged ’We’ who are the subject of history’ (Delanty 1995: 12). The works of Cornelius Castoriadis (1991; 1998) on reflective questioning of socially instituted representations are useful in reminding us what Europe stands for as a project among others. If there is a minimal specificity of Europe that could be defended, Castoriadis has argued throughout his work, it is precisely the lack of an unquestionable point from which a European distinctiveness could be reified. By historical contingency, for Castoriadis, it was in Europe that a genuine interest in the others as others emerged in the frame of the project of social and individual autonomy originated in ancient Greece and reasserted by the European modernity. 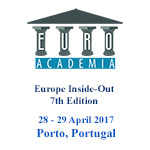 This presentation looks at the patrimonial/instrumental nexus in European identity making practices and narratives.